Let’s face it: Cleaning/redecorating your house is never going to be the highlight of your week. Sure, you can listen to those gripping murder mystery podcasts while you dust and install shelves. And of course, Mr. Roomba can help with the floors. But there’s only so much dirty work he can do. And while we can’t scrub the porcelain bathroom throne or hang curtains for you, we can certainly offer amazing savings on toilet cleaner, sponges, furniture and more. That’s why we rounded up the top 3 home improvement stores. 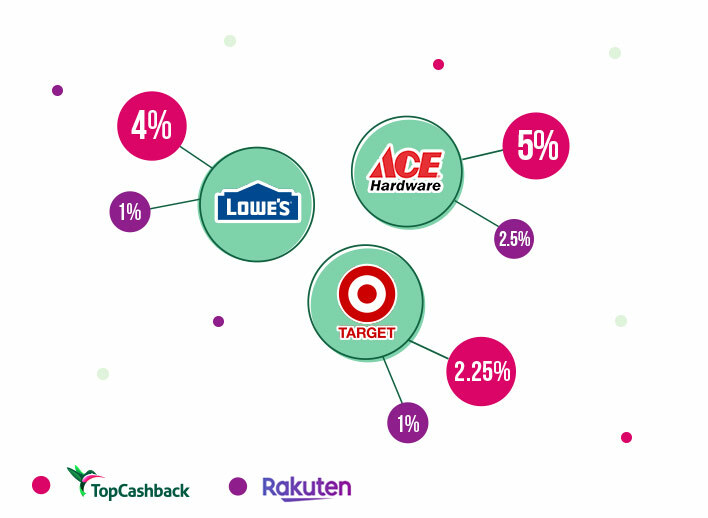 And we stacked our cash back rates next to Rakuten’s/Ebates’ to see who offers the best deals. But before we dive in, let’s take a peek at some handy shopping trends. According to the trusty Bureau of Labor Statistics, the average 3-person household shells out $16.75 a week on home improvement goods. They dish out $72.58 a month and $871 a year. This includes laundry and cleaning products, toilet tissues, stationary supplies, lawn & garden goods and more. $871 is a lot of dough. And that’s just for 3 people! Imagine how much families of 6 spend annually. Yikes. But before you get yourself in a tizzy, read on for the top housekeeping offers. They’ll cheer you up. Lowe’s is one of the go-to giants for home necessities. And for good reason. 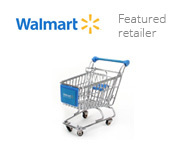 This heavy hitter has unbeatable prices and weekly offers. Pair one of their promos with up to 4% cash back for a savings grand slam. If you shopped at Lowe’s through us for one year, you’d get $34.84 cash back. Rakuten/Ebates only offers 1% cash back. So, if you went through them for 12 months, you’d earn a measly $8.71 cash back. But if shoppers settle for Rakuten/Ebates, they’ll be sadly disappointed. 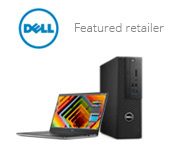 Because they only offer 2.5% cash back. That’s just $21.77 for 12 months. Womp womp. Like the monster stores above, Target is a place you can’t live without. But unlike all the others, it has some kind of mystical power that draws you in for one thing and makes you buy the whole kit and caboodle. Seriously, we dare you to shop for housekeeping supplies and not pick an outfit for your dog, an industrial-size jar of cheese puffs and a new bathing suit. Shop through us, and you’ll score 2.25% cash back. That’s about $19.60 for an entire year. Use Rakuten/Ebates, and you’ll get just 1% cash back. That’s only $8.71 for 12 months. Year's worth of cash back if you shop at Lowe's, Ace Hardware and Target for 4 months each. These are just 3 home improvement stores. If you’d like to play the field, you can try out each site for 4 months. So, say you shopped at Lowe’s through us for 4 months, that’s $11.61 cash back right there. And if you do the same at Ace Hardware, that’s $14.52. A 4-month shopping spree at Target will get you $6.53. Altogether, you’d earn $32.66 for the whole year if you combined 4 months’ worth of cash back from each store. If you shopped at Lowe’s through Rakuten/Ebates for 4 months, you’d walk away with $2.90. And if you did the same at Ace Hardware, you’d have just $7.26 to show for it. Splurge on 4 months’ worth of merchandise at Target through Rakuten/Ebates, and you’ll pocket $2.90. That comes to only $13.06 for the whole year. If you’re interested in the other ways we differ from Rakuten/Ebates, check out our handy guide. It covers payout options, signup bonuses and more.